Beaches: For an island city, Mumbai has a non-existent beach scene. Popular beach fronts include Girgaon Chowpatty & Juhu Beach – the waters are alarmingly dirty and the beaches crowded, so you’d totally be within your rights to skip them altogether, but most tourists can rarely resist the temptation. Religious Places: Befitting a largely religious populace, Mumbai has several world famous places of worship belonging to different faiths. You’ll see massive variety ranging from temples, mosques, churches, Parsi agiaries, and even a few synagogues co-existing side-by-side – a stark reminder of the diversely cosmopolitan nature of the city’s masses. Notable religious venues include the Haji Ali Dargah, a tiny islet located 500 metres from the coast in the middle of Worli Bay – you have to walk the 500 meters on a narrow pavement in the middle of the sea. Siddhivinayak Temple in Dadar is popular and local legend believes the deity to be wish-granting. Other notable places of worship include the ISCKON Temple in Juhu, belonging to the widely known Hare Krishna movement and the Global Vipassana Pagoda, in Gorai – a meditation hall built as a monument of peace & harmony dedicated to Buddha and his teachings is an excellent venue for meditation. Mumbai is fondly known as the ‘city that never sleeps’, which is true in most parts. Venture out at 3-4 am in the night and you’ll always find a decent number of people in the main-street areas. Auto-rickshaws & cabs ply their trade around the clock, though public transport usually stalls for a few hours at night. Mumbai has a massive number of bars, pubs & lounges – most remain open till well after midnight on weekdays and oftentimes till 2am on weekends. South Mumbai has several brilliant venues for a drink including a couple of microbreweries in The Barking Deer Brewpub & The White Owl, both situated in Lower Parel. A few notable clubs include Tryst, China House & F-Bar – all of which are upmarket venues. 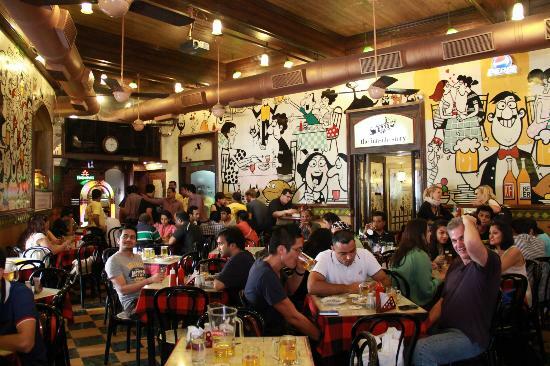 Cafe Mondegar & Leopold Cafe in Fort are renowned venues frequented by a very cosmopolitan mass, including large numbers of foreign nationals. In the western suburbs, Bandra & Juhu are the epicenters of nightlife activity with a plethora of pubs & lounges to choose from. Mumbai is the most liberal of Indian cities in terms of alcohol consumption, even for women – but just as everywhere else, you’d do well to keep your wits around you while consuming alcohol.